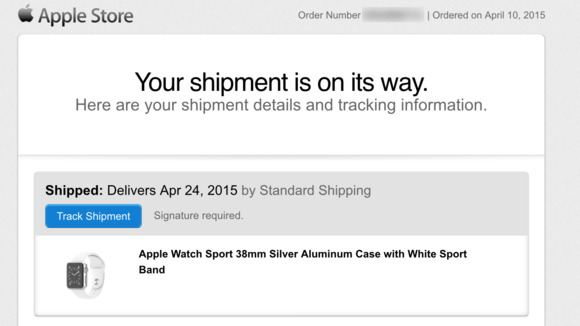 Apple Watch is coming, and for many, it will arrive as soon as Friday. Lucky Apple Watch buyers who saw an April 24-May 8 estimated shipping date on their pre-orders earlier this month have received notice that April 24 is the big day. If your Apple Watch is scheduled to arrive tomorrow, you should have received an email from Apple—and possibly an Apple Store notification—that the Watch is in transit. Over here at Macworld, my own Watch is scheduled to arrive on Friday (dragging myself out of bed at 3 a.m. Eastern paid off!). We’re hearing anecdotally that the 38mm Watch Sports with white bands are more likely to arrive tomorrow, while readers who pre-ordered Sports with black bands report that their orders are still processing. Has your Watch shipped? Which model did you pre-order? International readers, we want to hear from you: Tell us when your Watch arrives. Share your excitement in the comments.